Whether you love it or dread it, winter is a part of life here in the North Country. Just like all other seasons, winter comes with its own set of hazards, but also with new opportunities to improve your health and wellness. So, as the days grow shorter, the nights grow longer, and the cold begins to settle in — consider your health! 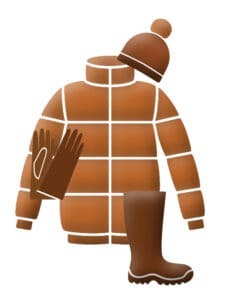 Since it is common for temperatures to drop below zero, it is important to wear appropriate outdoor clothing, including mittens, hats, scarves, and boots. In some cases, you may need to wear waterproof or wind-resistant clothes to keep warm. Without appropriate winter clothing, hypothermia or frostbite can occur quickly and cause serious health problems. If the outdoor temperature is 0ºF or colder, frostbite can affect exposed body parts in just 30 minutes. However, with the right outdoor clothes, it is important to get outside and remain active in the winter. It can be tempting to stay indoors, but outdoor activities like snowshoeing, skiing, snowboarding and ice fishing are good ways to stay fit during winter months. Even winter chores like shoveling your driveway or clearing snow from your vehicle are opportunities to get active. If you prefer to avoid the cold, you can visit a local gym, use a treadmill or exercise bike, practice yoga, or do other daily exercises in your home. Not only is staying active in the winter great for your physical health, but it can also help ward off seasonal affective disorder — a form of depression that occurs at the same time every year, typically winter. During the winter months, your chances of getting the flu are greater, so it is important to get your flu shot. To find a list of places near you that offer flu shots, visit vaccinefinder.org. To prevent the flu and colds, you should wash your hands frequently with soap and water, throw tissues away right after you use them, and limit your contact with others who are ill. If you have flu-like symptoms, stay home from work or school. Drinking lots of water is also important during the winter, even though you may not feel thirsty. Keeping your body hydrated will keep your skin healthy and boost your immune system. Finally, don’t forget about others! Winter is an ideal time to check up on friends, relatives and neighbors, especially those who are older or who have trouble getting out of the house. Once you have prepared yourself and your family for the winter months, it’s important to get your home ready as well. Take the following steps to keep your home safe and warm this winter. Before you start turning up the heat in your home, it’s a good idea to have your heating system serviced professionally to make sure it is clean and safe. If you have a fireplace, be sure to have your chimney cleaned and inspected before using it. Check your smoke detectors. House fires are more common in winter because of heating, holiday decorations, winter storms and candles. Check your carbon monoxide detectors, or install them if you do not have them. Carbon monoxide is found in fumes from vehicles, stoves, fireplaces or furnaces. It is colorless, odorless, and deadly. Carbon monoxide poisoning can cause headaches, dizziness, upset stomach, vomiting, and chest pain. Icy sidewalks make falling easier and put pedestrians at a high risk of fall injuries, especially the elderly. Use a shovel or snowblower to clear away snow, and then shake rock salt over any ice to help it melt. Just like you can prepare yourself and your home for winter, you can also take steps to get your car ready for cold weather. 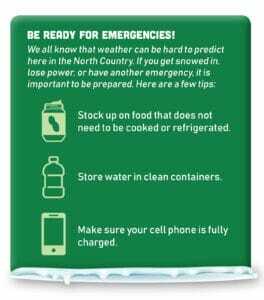 Putting together a winter emergency kit for your vehicle is a good idea — you should include items like: a cell phone, portable charger, and extra batteries; blankets and warm clothes; food and water; jumper cables, flares, and a tire pump; a flashlight, and a first-aid kit. Try to keep a full tank of gas in your car, in case you need to run it to keep warm in an emergency. Keeping your gas tank full also helps prevent ice from forming in the tank and fuel lines. Be aware of current and forecasted weather conditions when you are traveling, and avoid traveling when the National Weather Service has issued warnings or advisories. Keep a close eye on road conditions, especially on local roads where traffic is light and plows may not clear snow often.